Illuminating the simultaneously sacrilegious and divine poetry of the religious visionary William Blake, this full-length theatrical presentation defies all expectations of both literatary theater and juggling shows. Bringing literature alive for kids! Contact James Jay for more information about this new project. This 5-10 minute variety act has pretensions of developing into an entire Dada Circus. Complete nonsense! Perfect for weddings! This skit brings to live the passage about love in II Corinthians 13. Can be packaged together with other wedding entertainment, or given as a gift to the wedding pair! 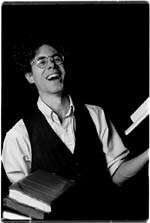 The juggling of James Jay is the gravity of God.